It may not be the household item that catches a person’s eye or thoughts while looking for hazards, but toilet seats have options available today that many caregivers are unaware of. The toilet seat should not be overlooked as a way to help a loved one stay independent as long as possible. It also can be a location of great concern for those prone to falling or for caregivers who must help transfer their loved ones in order for them to use the toilet. From extra padding to extra height, these specialized seats make it easier for elderly loved ones to get on and off the toilet. The industry, however, is bringing innovation one step forward with power-lift toilet seats. There are two main types of power-lift seats on the market. The first is a spring-powered option. It is already in an upright position when a loved one approaches it, not like the usual toilet seat. It hinges on the front and meets a person’s rear while they are standing. When a loved begins to sit back, the spring and hydraulic piston slowly lowers them to a seated position. With this option, the device takes about 80 percent of the weight off the person using it. When a loved one is finished, he or she stands up independently, with the weight again being minimized by the hydraulics in the system. The second option is completely motorized, assuming 100 percent of a person’s weight. This is a great option for someone who needs full assistance. 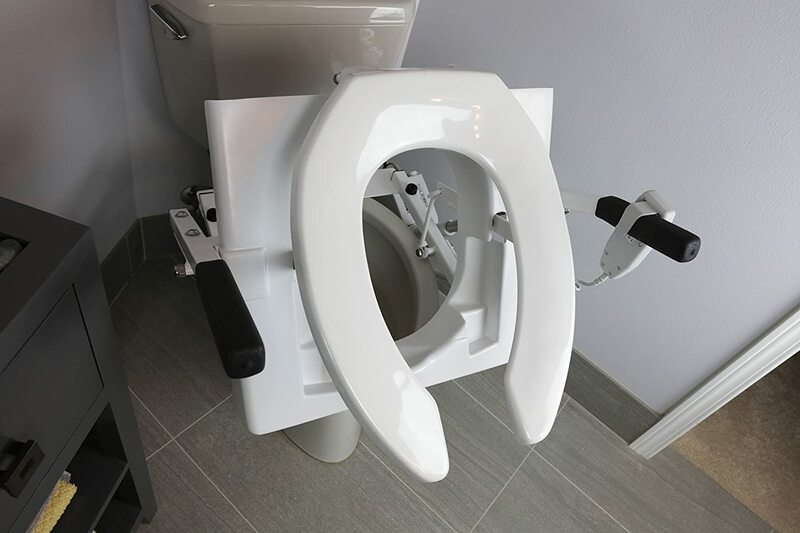 It installs on the toilet and includes a hand controller for raising and lowering the seat. The controls help the seat meet a loved one in their standing position; then, with a small lean back, lowers them directly onto the toilet. When the person is finished, the controller again is available to lift a loved one to a complete standing position. For larger people, a dual-motor option can be bought for additional support. A power-lift toilet seat is available in either a free-standing or wall-mounted product. The free-standing seats are able to be used bedside, which some people may prefer for flexibility. The good news, if you are considering a purchase, is that if a physical deems this kind of support medically necessary, many insurance companies will help cover the cost. A caregiver can do some easy research to find out their loved ones’ benefits. Would a Power-Lift Toilet Seat Be A Good Option For You? Time in a bathroom is typically a very personal thing. Many loved ones may feel embarrassment needing assistance, especially if they still are very mentally aware and simply experiencing the standard bending/reaching issues that often come with age. With more progressive needs, an aide still must assist the person in getting on and off a toilet. 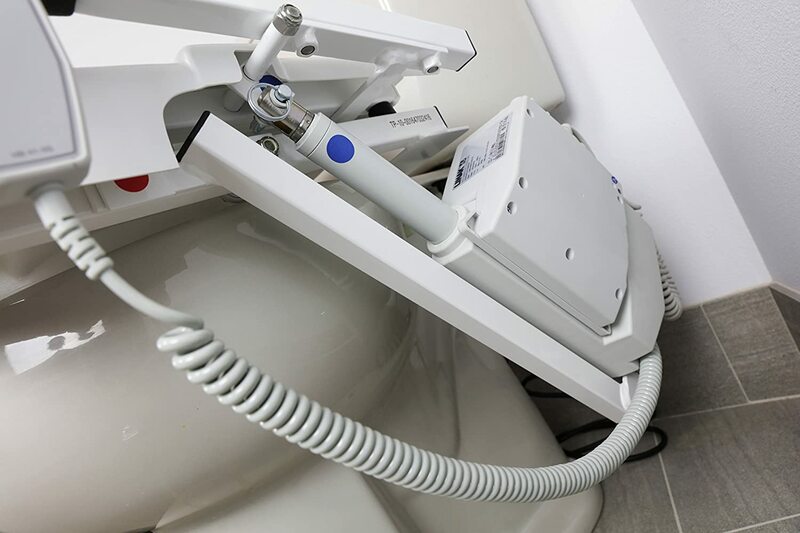 From another point of view, a power-lift toilet seat is an ideal option for someone in recovery from a surgery or illness. It helps people return home and stay home longer. From knee issues to back concerns, a long list can be made of times when a power-lift seat is beneficial. Toileting is one thing that no person can ignore, and a little help can go a long way for someone who just needs a boost. Safety is of utmost importance to all those involved in caregiving. All power-lift toilet seats come with weight recommendations, but most are between 250 to 500 pounds. There are also bariatric versions available. The power-lift toilet seats help caregivers and loved ones alike, by promoting independence and dignity, while preventing injuries. Falls are a big safety risk for people with uneven gait, or wobbly knees. Elderly people are especially at risk, as any caregiver will attest. A power-lift toilet seat tremendously minimizes that danger. While these products were designed originally for hospitals and other care facilities, they are now available for the consumer. Caregivers are thankful for fewer falls and trips to the emergency room, and loved ones are grateful for regaining a sense of self-worth and respect. 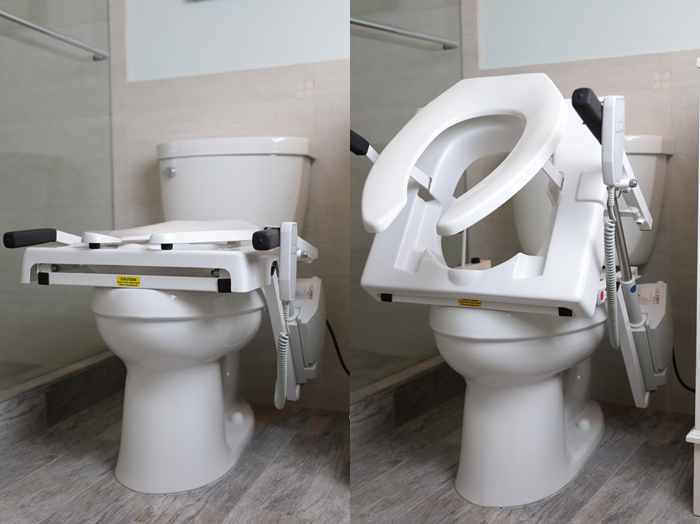 I recommend the TILT™ Toilet Incline Lift (once known as the Tush Push from Phillips Lift Systems) as the best solution to help prevent falls in the bathroom while using the toilet. This device lowers users to and from the commode. 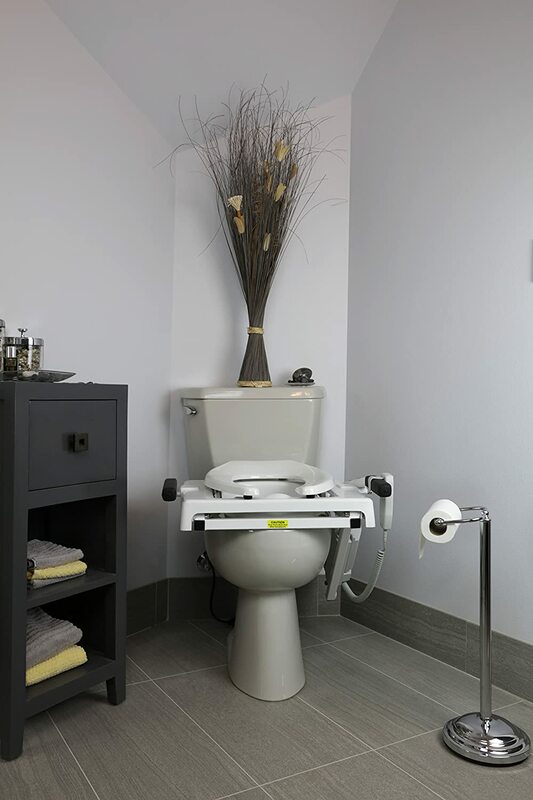 The TILT™ Toilet Incline Lift provides comfort and safety along with the functionality of a heavy duty commode lift chair. This lift is compatible with both standard and elongated toilet seats.This toilet lift accommodates users 5’2” to 6’4” and bowl heights from 14” to 21”, and has a weight capacity of 325 lbs. The TILT™ is equipped with Companion Control to allow the user or caregiver to easily operate the seat with the push of a button.The TILT™ is designed for easy installation and comes with a 2-year warranty. The TILT™ is made in the USA. Easy installation – typically less than 15minutes. 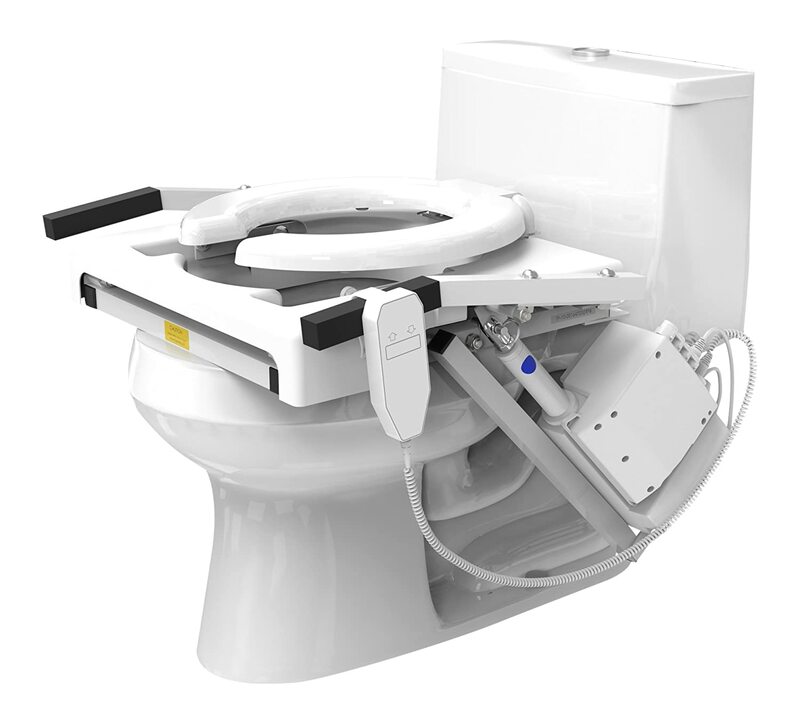 The TILT™ Toilet Incline Lift is compatible with both standard and elongated toilet seats. The TILT™ offers great stability, as the TILT attaches directly to the bowl, rather than pushing the unit over the commode. The TILT™ moves the user 7-1/2” forward, which is ideal for clearing obstructions and rising from the bowl. This also positions the user’s shoulders over their feet for optimal balance and positioning. Arms remain at a constant positioning angle, which keeps the elbow of the user slightly bent to maximize their ideal strength position in order to exit the seat. The low angle of the unit allows for easier lateral transfers from mobile devices, chairs, transport chairs, and bath seats. In the down position, the arms are lower than the seat for a slideboard transfer. The hand grips feature non-slip covers. Loved this post Install A Power Lift Toilet Seat For A Safer Bathroom . Sharing it on my Facebook and Pinterest profile. I’m glad you liked it – thanks for the share! Thanks for your comment, Caroline. The “TILT™ is a high quality seat.